In April of this year, I was teaching class, and I kept hearing, “fwip, fwip, fwip, fwip,” but I wasn’t sure where it was coming from. I looked around and noticed one student spinning something on his desk, and another with his fingers. The students were completely engrossed in the movement of the fidget spinners, and it was difficult to get them back on track. A fidget spinner is a type of low-tech fidget toy that has been touted as a helpful focusing tool for students with ADHD, anxiety, and stress. A fidget spinner is made up of circular grip in the center of a multi-lobed flat structure made from either metal or plastic. It is designed to spin around its center. Do Fidget Spinners Help Anxiety and ADHD? The companies who make fidget spinners make claims that these gadgets help adults and kids relieve anxiety and stress. Additionally, they claim that the fidget spinners help those with Attention-Deficit Hyperactivity Disorder (ADHD) concentrate. Those who believe that fidget spinners should be in the classroom think if a student is trying to concentrate on a task, and their hands are busy, it forces the brain to increase its effort to focus on the task. Whether a student is squeezing a relaxation ball, tapping a pencil, or playing with a fidget spinner, it would naturally force the brain to work harder. The brain puts more effort into not being distracted. Those with ADHD with hyperactivity would benefit the most from fidget spinners. Because of their excess energy, it gives them an outlet to keep them focused and pay attention in class. 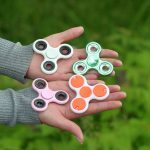 In fact, fidgeting has shown to help students with ADHD stay focused; however, some experts like Dr. Mark Rapport of the University of Central Florida question whether the fidget spinner involves enough physical movement to actually benefit the child. So while it is possible that having fidget spinners in class may help motivate a student with ADHD, it is also possible that they would simply distract the child. Unfortunately, there haven’t been enough studies to prove one side or the other correct. Should Fidget Spinners Be Allowed in School? Because there is no scientific research to support the claim that fidget spinners are beneficial in the classroom, teachers, parents, and schools have chosen to eliminate them from the class. They argue that fidget spinners are so much fun, instead of helping students to concentrate, they become an added distraction. On the other hand, parents post stories on the internet, saying that their children with Autism or ADHD focus better when using a fidget spinner. Are the stories true? Are the results different for a student working alone as opposed to a student working in a class? What should parents and schools do? Without overwhelming scientific evidence to offer a clear direction, parents, teachers, and schools will have to continue using their best judgment. And decisions might need to be made on a case-by-case basis. If the fidget spinner is helping a student focus, let it stay. If the toy is distracting the student or the class, it needs to go. Do you think fidget spinners actually help students focus or are they a distraction? Tell us in the comments. Tags: Do Fidget Spinners Help Anxiety and ADHD?, Do Fidget Spinners Help Kids Focus in Class?, Should Fidget Spinners Be Allowed in School?, What are Fidget Spinners?